Location: Forum Index » Scrapbooking Forums » General Scrapbooking » do you have something you never used? what? Haha, ONE thing?? I'd say the item that I'm most itching to try but haven't had a chance yet is the set of metallic Distress stains that are sitting here on my table. I haven't even taken the plastic wrap off them yet! My 300 sheets of new paper that came a few days ago! I am hoping to change that today! Edited by SHARON ELISE on 10-06-12 08:53 AM. Reason for edit: No reason given. My newest Cricut cartridges - Pack Your Bags and Gingerbread. My Cinch. It's been in the box for well more than a year. I also have some stamps that I've never used, some papers, some markers....lots of little things! I bought a bottle about 2 years ago and have never used it! I wonder if it's even any good anymore. Well, I guess it doesn't matter because I can't find the darn thing! The fastenator....have had it for at least 5 yrs...never used it..never could find a place to use it. got them today and use them soo cool!!! go for ti!!! sorry mine too I use it one in a blue moon!!!! don't have one make some book for friends. OK lots of little things we need to do some serous scraping to do. I have the same thing going on in my room!!!! Thanks I had fun keep them coming!!! some times I just need to get out of the gallery!!! I have two sets of Lindy's...and they aren't cheap, but I'm afraid to use them. I have a set of paint, then just got a set of embossing powder. The embossing powder I have an excuse for...it just arrived today, but who knows when I'll ever use it. I have a Creatopia that I never use. I know it works, but the way I'm situated right now, it's too hard to get out and my little Cuttlebug lives right at my feet, so it's much handier. I have several nesties I've never used. Lots of stickles I haven't used, but I have all the colors and just haven't needed to use them all yet...but I will. I bought a set of chalks from Michaels for $3 about six months ago - it's still in its wrapper, but I don't feel too bad about that since it was so cheap. And I was DYING to have the sew ribbon, but I haven't taken that out yet either. I wand the sew ribbon. please use ti i want see it!!!! as for the chalks get a a temple and go crazy!!!! Some Sizzix dies, and one of my two sets of Spellbinders. I started a thread a few weeks back about my unused cuttlebug...I have owned it for at least 6 months and only just tried it this week in a LO. It was nice, but I need more embossing folders and some dies to make it really worth the while, and $$$ is so tight right now, that's not gonna happen. I bought a bone folder, dont make cards; bought lots of pink themed paper (cause its my favorite color) and I have a boy; circus-themed paper and we've never been to a circus but might someday...tons of stamps and no ink pads (!). Stupid stuff, that I will maybe do someday, things I have heard others rave about and have to have...and on and on... What can I say, I like to feed my addictions for shopping and scrapping. Martha Stewart scoring board/kit. I do plan to learn about it and use it. I've only had it two years! i can't even begin to name them. But i have alot of embellishments, glimmer mists, ppr and paint that have not been touched.I've had that score board for a year, still untouched in the package. About 40 jars of MIcro Glitter at $7.00 a jar. 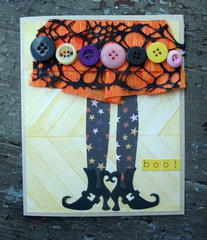 So far I have played with my embossing folders but haven't actaully used one yet. Twinkling H2Os - bought a ton of those. Never used them. I have about 12 Cricut Cartridges, only used 3. Bought tons of Fiskars, MS and Success punches and border punches. Used about 10% of them. A few cricut cartridges never used. The fastenator, I used it only once. Martha Stewart scoring board/kit, still in the pkg. Fiskars shape cutter with the templates. A whole set of Paper Edger Scissors - Set of 12 Pattern Edgers with Oak Stand. Im sure there are more things but this is what I could think of now. Edited by armygirl on 10-07-12 03:05 AM. Reason for edit: No reason given. Well to start with: this. yeah I guess it is all true. Yesterday I picked up some gesso so I want to try that too. Well, let's see.......I have a TON of stamps I have not used ....YET. I know I will though because I know why I purchased them. Thing is, I want More! I can definitly buy faster than I can use! There is a whole shop full of stuff in my room not used yet.....or only used once or twice. I have nver heard of something not being sold without a cord. I think if it didn't come with a cord, I wouldn't buy it. Ridiculous! I have a hot glue gun and glue sticks still in the packet. I'm kind of scared of it. Sounds like me and my creme brulee torch Rosey. Its been in the wrapper or box for about 10 years. Vinyl - I'm going to try it as soon as I get a chance, but I've had it for over a year. Chalkboard paper that I had to have. I've got TWO Cropodiles. One I bought and one was a gift from someone who didn't know I had one already. Both are still in the package unused. I've got one of those, too, that I've never used. I've also got tons of acrylic stamps, wood-mounted rubber stamps, and unmounted rubber stamps. I've also got nesties and a Grand Calibur that are still virgins cause I'm askeered and intimidated. Pitiful. I love my Crop-a-dile too! It is one of my must-have tools. My fastenator!! I really wanted the thing, got home with it, tried it twice, and haven't used it since. It didn't staple the way a normal stapler does, and it made bigger holes than a regular stapler. Color me unimpressed with it! I just HAD to have a Silhouette. Used it twice. Then 2 months later I went digital. My husband is still quite crabby about that one. In regards to the Vagabond...Open the compartment on the end, it is made especially to store the cord. It is the end opposite of the side where the power cord is plugged in. As someone else explained below this post, the cord is stored in a compartment on the opposite end of the machine from where it would plug in. I remembered this post when I got home last night and looked to see what I had that was egregiously unused. 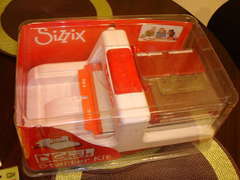 Staring me in the face (and taking up lots o' room) was the Sizzix Big Shot, which I bought at a LSS garage sale about 6 years ago. Haven't used it once. Stickles. I keep saying one day I'll try them if they aren't all dried up! I couldn't scrap without my Big Shot!! Flocking powder....forgot all about that stuff!! Well for me it would have to be Embossing Powders. They looked like such a great idea at the time of purchase but I just don't seem to get around to using them. And Ribbons.... and yet I keep buying them. So pretty all the colours and patterns. My BF and scrap buddy is always on my back about using them and you can be sure every challenge kit she makes me , yup theres a stash of ribbons. I could never get that thing to line up right, so I use the fastenator staples without the fastenator. Just push them through the paper (you may have to poke a starter hole in thicker paper), then fold back the ends like you would a brad. My never used items include a few foam stamps, some glitter, a texture hammer and paddle punches. Oh yeah - and those little bugs that poke sewing holes in paper? I dont remember the names, but they were little pink spotted bugs sold 2 in a pack. Never used. I hate using Embossing Powders and have so meany!!!! I have no idea what a rock tool is! Yes, I have a Fiskars Crimper, my mother-in-law let me borrow that actually belongs to my sister-in-law. I think I will use it. 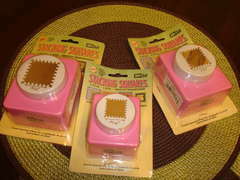 Stamps...I know I will use and how I will use them but have not yet. I never buy anything without having an idea of how I will most likely use it. I didn't buy it but I was given lots of eyelets. Never use it! my xyron. i've had it for over 6 years and never opened it. if someone wants to buy it, PM me. Gotta ask....did you look in the compartment on the side of the machine where you are supposed to store the cord? I kind of went crazy over the summer buying a bunch of stuff. Some stuff I planned to use, others I saw a video or something and wanted to try it but didn't. But most of the things I don't use (tools) are because they were on clearance, I had to have them, but don't really need them. My xyron has never been used, nor has my X. I got a set of circle cutters and used it once. I have a bunch of cricut carts still waiting for the perfect LO. I keep buying chipboard, but I'm intimidated on how to paint it or whatever and worried I'll ruin it. I have some perfect pearls, still in the packaging for 6+ months. I don't really buy stamps but I have picked up a few that I had ideas for, and haven't used them. I picked up some colored craft wire... haven't used it either. I do have tons of embellies and papers and stuff but I don't really count that because I like to have a stash so I don't have to go to the store all the time. OK now go use it!!!! I really don't like my Gypsy very much either. I've welded a little bit with it but it is so cumbersome. I have a friend who uses her constantly and makes beautiful things with it but she understands it much better than I do I guess. I made this with my Gypsy keep playing with it!!!! Edited by Kathy Edwards on 10-11-12 09:09 PM. Reason for edit: No reason given. I love my gypsy. I don't use my cricut at all without it. I watched a couple of videos on you tube to figure out some stuff. Welding really is easy once you get it. Type 2letters. Scoot one of them over so it's touching the other one. On the second tab, hit the weld button, then the eyeball to see it. What's grey should be where the letters touched. The grey parts don't cut. Kathy, I am sooo jealous of your crossword page...it is so awesome!! I just may have to scraplift some or all of this!!! what a wonderful page as a crrosword item. So creative...and the colors are so amazing! Kathy - I'm behind on gallery love for you and will get over there in the next few days - leaving town in an hour or less so it may be first of the week when I get back (my mom doens't have internet). Love the crossword layout - absolutely love it! I definitely want to "lift" this but don't guarantee results like yours! Yours is gorgeous! Madmatter - that's awesome! People on here just rock. I love this site! I love my Gypsy!! we have a club that meats every month it help have help!!! and we get use our friends cartridges!!! I must of cut 14 of my crossword lay out when I was done every pinched to get me a new blade that was so nice!!! Thanks!!!! Thanks!!! I going to make those cool windows that are show up no LO!!! 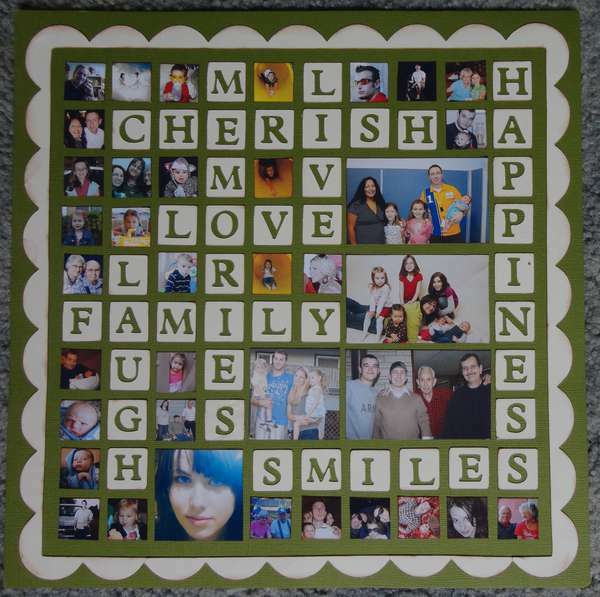 crossword is just a bunch squares the hard part is the photos!!!! lots of computer work!!! When I first got my Gypsy I made LOs with my grand kids and they where awful, and they love them so keep trying!!!! My circle cutter. I don't have very much success with it. I think you are supposed to use a glass cutting mat, and I still haven't bought one. I am happy with the mat i have, and I can't justify the cost of a glass mat for something I don't use. Yes - but I just used it today!!! I use a glass cutting board, but you could also use the glass from a picture frame (edges taped). Just make sure you buy one a little larger than your largest circle. It seems to me that you don't really need the gypsy if you use the Cricut Craft Room on the computer, right? I can weld and all that kind of stuff from here. Is there anything the gypsy can do that craft room can't? I also do not use the Bowdabra bow-making thing that I got months ago! Edited by jaspernonyx on 10-14-12 02:15 AM. Reason for edit: No reason given. good luck with the cutter!!! The bow-making thing LOL I could never finger that one out!!! That is so cool scary!!!! This thread is so funny! I have some of the same unused stuff, and some of the stuff ya'll have posted as never having used I couldn't do without! Maybe we need a "use the stuff you have unopened" challenge or something! Several Cricut cartridges, glitter, a card kit I bought in Aug. I spent $14.95 and I don't even understand why I bought it. I'm going to a convention later this week and I will not allow myself to buy stuff like this again. You can have my flocking....I'm getting rid of it!